A simple vegan brunch option packed full of goodness and flavour. Heat a large, heavy based saucepan over a medium heat. Add the olive oil and shallots and cook until they have softened, about 4 minutes. Crush the garlic and add to the pan along with the pepper, paprika, thyme and chilli flakes. Allow the heat to release the aromas and continue stirring for 2-3 minutes. Add the beans along with 2 cups of water. Turn up the heat and bring the mixture to a simmer. Leave to simmer for 10 minutes to allow the beans to soften and the liquid to reduce. Once the liquid has reduced, check the seasoning and add salt and pepper if necessary. Finally, add the chopped asparagus and allow to heat through for 5 minutes until cooked but still tender. While the asparagus is cooking, pop 4 slices of sourdough in the toaster or under the grill. 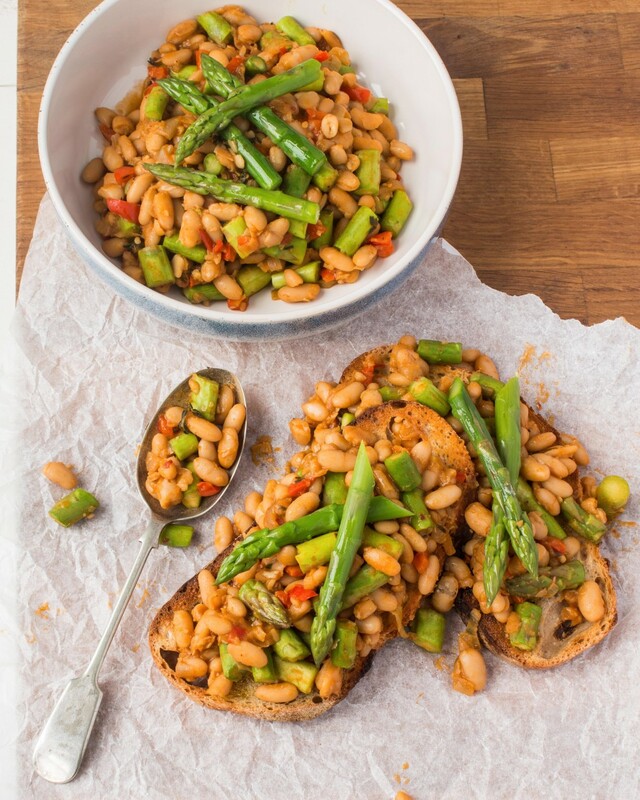 To serve divide the toast onto 4 plates and spoon over the beans and asparagus and top with a drizzle of olive oil.